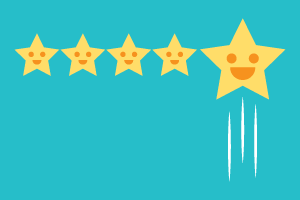 Patients want a favorable experience when they come to your clinic. A customer shopping for any product or service is hopeful for a good experience. When our “customers” are out “shopping” or being referred to our therapy services, they too expect a good customer experience. In today’s competitive medical world, excellent customer service must be delivered to compete effectively. Private practice physical therapy is no exception; patients are looking not only for a good rehab outcome but also for a favorable experience when they arrive at your clinic. By mindfully paying attention to your patients and the way in which you deliver your services, your office staff can learn how to deliver quality customer service. A customer’s experience starts before they even arrive at your office. The initial involvement with your brand starts when booking the appointment or finding directions to your clinic. All of your print and online information is a form of customer service. Your marketing materials and business cards may be tied in with the customer’s experience, but the way they find out about your office is significant as well. Were they recommended by a trusted friend or their primary care physician? Did they choose your clinic based on reviews found online? Are you the closest office to their house? All of these small interactions with customers are part of the whole therapy experience. When we think about our patients as customers, we know that everyone has a different standard for good customer service. For some patients, good service is a text message appointment reminder; for others, a good experience could be reflected in the print quality of the at-home exercises they take with them. Getting to know your customers and how they would like to receive your services provides indicators on how to deliver excellent service. Another aspect of excellent customer service involves how well your staff helps motivate patients to adhere to exercise and protocols, which in turn helps produce better rehab results. Some patients can have a poor experience if they feel uncertain or confused about home instructions. Clear communication between the patient and the clinic’s staff members can be the difference between the rehab outcome alone and the patient’s overall experience. When we open dialogues with our patients and get to know how to best provide our services, chances are they will have a good experience by the end of the time they are healed. Patient education can additionally be a cornerstone of good customer service. Providing each patient with an understanding of their diagnosis and how to best care for their injury can help them relate to the importance of the therapy process. Offering handouts, website links, and other informational pieces can support your patient’s experience through the progression of their appointments. Getting to know your patients takes an ample amount of time, additional effort, and real follow-up from your staff. Simple actions at the initial intake of information or before an appointment can set the tone for the delivery of excellent services. Are you asking your patients what name they prefer to go by? Is your staff asking if they would like a coffee while they wait to be seen? Is your front door already open at the start of business hours? 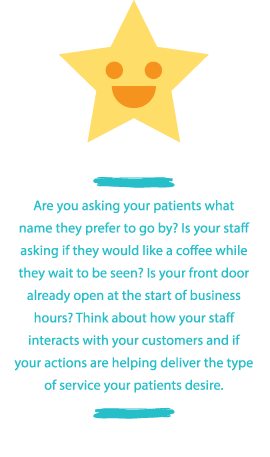 Think about how your staff interacts with your customers and if your actions are helping deliver the type of service your patients desire. Executing simple qualitative research can help you discover what your patients like, or dislike, about your services. Sending a postdischarge email survey can help you uncover information or notice trends in excellent service. Asking customers for feedback in person can provide your clinic with an abundance of info that can help you shape the way in which you deliver your services. By paying attention to patient responses and by making adjustments in your day-to-day operations, excellent customer service is achievable for any office. Just as each outpatient office is different, so is each therapy patient. Our customers often need individualized care to help ensure they are receiving a good rehabilitation experience and overall good customer service. Delivering first-rate service can be achieved through the use of mindful marketing materials, tailored staff interactions, and patient research. Paying attention to customers and delivering services which they deem as valuable will enhance your competitive edge. Jenilee Jaber is a regional practice representative for IRG Physical Therapy in the state of Washington. She can be reached at Jenilee.Jaber@irgpt.com.